This page will be updated during the course of development of the Biopack facility as it is under development for the STS-107 Shuttle flight. More detailed information will become available in the future. See end of this page for Biopack mission preparations. A previous, referenceable, description of the Biopack facility was published by Van Loon and Riesselmann in the ESA Microgravity News Vol. 11 No. 2. The coming years for microgravity research will be dominated by the assembly of the International Space Station (ISS). During these assembly flights of the US Space Shuttle, Russian launchers and at a later stage the European Ariane, only limited flight opportunities are available for microgravity researchers, especially biologists. Therefore there is a need for small sophisticated payloads, requiring limited resources, that provide scientists with experiment platforms to conduct science during the ISS assembly phase. Space Shuttle Middeck Locker-based payloads are the most suitable in this respect. The Biopack is such a locker-based facility that builds on already existing experiment hardware and facility infrastructure. The Biopack provides scientists with a research facility for biological experiments under varying gravity conditions. Although the Biopack builds on ESA's very successful facilities Biorack (flown already three times in Spacelab and three times in Spacehab) and Biobox (flown three times in the Russian retrievable capsules and once in Spacehab), its design and operations scheme overcomes some of the disadvantages of the previous facilities. Biopack is aiming for flights in the Space Shuttle middeck, in Spacehab, and at the long-term in the European Drawer Rack (EDR) in COF, the Columbus Orbiting Facility (See also the end of this page). The multi-user facility Biopack includes an incubator with three centrifuges, a cooler, and a freezer. The facility is designed using the standard ESA Type-I/E and Type-II/E experiment container (ECs) interfaces. The Biopack is designed to accommodate small biological samples e.g. mammalian cell and tissue cultures, small plants or insects. The microgravity environment of space is essential for studying the effects of mechanical stress on growth and development of biological systems as a baseline value. The microgravity condition during orbital spaceflight is unique for studying cells and tissues in the lowest possible mechanical stress environment. On board an orbiting spacecraft, such as the Space Shuttle, or ISS, biological samples in the Biopack may be exposed to gravity levels ranging from microgravity up to at least 2×g. Essentially, Biopack consists of two units, the Biopack Interface Frame (BIF) and the Biopack Experiment Insert (BEI) (see Figure 1). The BIF encompasses all spacecraft interfaces and part of the Biopack electrical and thermal infrastructure; it accommodates the BEI. The BEI is the actual payload; it includes three experiment compartments: the incubator with centrifuges, the cooler, and the freezer. STS-107 pilot Willie McCool training with the actual Biopack facility during the Crew Training at ESA-ESTEC. The BIF occupies the volume of two Space Shuttle Middeck lockers. It is the primary interface to the spacecraft, mechanically, thermally (air-cooling), and electrically (28 VDC power and telemetry / tele-command data), and to the crew. All Biopack functions can be controlled and monitored by the astronauts from the Control and Monitoring Panel (CMP). Picture of actual Biopack CMP. On the CMP, controls for main power, for stopping and starting each individual centrifuge and for setting the incubator temperature are located. Indicators are available for major Biopack status information. In addition, a palmtop computer which forms part of the CMP, will be used for controlling Biopack's operations and displaying housekeeping and experiment data. The Biopack will be capable of displaying, down-linking, and locally storing all parameters available in the facility. All the data of the Biopack system will be sampled and stored each second on the palmtop hard disk The hard disc has a size of 4.3 Gbyte, using 3 Gbyte and each second about 700 bytes are generated, so about 50 days of data storage are insured. The data will be stored in blocks of one hour. The system will have its own system time, that will be part of the housekeeping data. This insures that for all the data stored, its time is always known. The system time is generated by a free running clock, not directly related to the time in the Shuttle, Spacehab or ISS. All data can be displayed on the dedicated palmtop and is send via the serial telemetry line to the "ground station". Data recorded include various temperatures, centrifuge speeds, door indicators, experiment sensor values and switch settings. Biopack and experiment operations can be adjusted manually, in flight, or through telecommands when necessary. Figure 2: The Biopack Experiment Insert (BEI). To store samples before or after the incubation period, two temperature controlled areas are available. Ten Type I/E containers can be stored in the +4 °C cooler, while the same number of containers can also be kept frozen in a -15 °C freezer. Transfer of ECs between incubator and freezer or cooler requires astronaut actions. To speed up the freeze/cool down time for an EC, special freeze/cool locations are provided in the cooler and the freezer. These locations, two for each compartment, are equipped with stronger cooling elements (peltier). The cool down time, for 37 °C down to -15 °C / 4 °C, will be about 90 min. The EC freeze / cool down locations are thermal decoupled from the other eight ECs store locations, in order to minimize cross talk between the "hot" and "cold" ECs. To increase cooling capacity, it is also possible to set the -15°C freezer to function as a 4°C cooler. All static as well as the centrifuge positions of the ECs in the 20º to 37 °C incubator have electrical connectors that interface with the Type-I/E and Type-II/E containers. There are power and data line connections to the experiments. Activation signals can be issued to experiment units either automatically via preprogrammed time lines, they can be manually started by a crew member or by tele-command. Experiment (sensor) data can be displayed, down-linked and / or stored locally in the palmtop memory. In the early days of microgravity experimentation, only microgravity samples were brought into orbit. Results obtained from the flight samples were compared to the ground 1×g controls. For the first time during the Cosmos series of flights, on-board 1×g centrifuges were used for control samples(1). By applying these centrifuges, a distinction could be made between 1×g ground and 1×g in-flight samples. For various reasons, in-flight 1×g samples plus 1×g ground controls are essential for evaluating microgravity effects. Differences between microgravity and 1×g on ground could also derive from various artifacts. For example, launch accelerations and vibration to which flight samples are exposed are not experienced by ground samples. Small in-flight gravity disturbances are not simulated for ground samples. There is also the always present cosmic radiation outside the Earth's atmosphere / magnetosphere. This radiation could have an impact on the spaceflight / microgravity samples, while it would be absent in ground samples. Also environmental differences in a particular payload, such as small temperature differences, gas composition or crew operations, may vary between in-flight and on-ground samples. Besides the unit gravity level for in-flight controls, the centrifuges may also be used for more detailed studies on biological processes under varying gravity conditions. (See also Paragraph 3.2 'Acceleration Profiles'). For their biological research facilities, ESA has defined two standardized ECs known as Type-I/E, with an internal volume of approximately 65 ml (~ 81×40×20 mm), and Type-II/E with a volume of 385 ml (~ 87×63×63 mm). This standard has been adopted for the development of payloads dedicated to biological research. The most successful and best known payload in this respect is Biorack(5,6). Besides Biorack, also the Biobox(7) and sounding rocket payloads such as the Cells in Space (CIS)(8) module adopted the Type-I/E standard. By now, not only European but also US/NASA experimenters are familiar with the compact but versatile experiment possibilities in these containers. Experiment inserts for mammalian cells, bacteria, fish, plants, and small insects have already flown. And it is this collection of hardware now available for Type-I and Type-II containers which provides a catalogue of experiment modules readily adaptable for future experiments. This hardware know-how reduces the development time and costs for future experiments which can make use of already qualified modules. Type-I (left) and Type-II experiment containers. the startup of the experiment. The overall lead time can be as much as 15-20 hrs. up to several days. The Biopack facility should drastically reduce this lead time. First of all, the Biopack Experiment Insert (BEI) remains as one unit throughout the integration process. All experiment containers are loaded into the BEI, after which it is transferred to the launch site and integrated into the Biopack Interface Frame (BIF) already mounted in e.g. the Space Shuttle Middeck or Spacehab module. Secondly, the temperatures in the BEI will remain at the preset value throughout the lead time. Thirdly, the accelerometer in the Biopack will detect microgravity as soon as the Shuttle reaches its orbital phase. When microgravity is reached the Biopack automatically switches to experiment activation without delay or crew intervention. 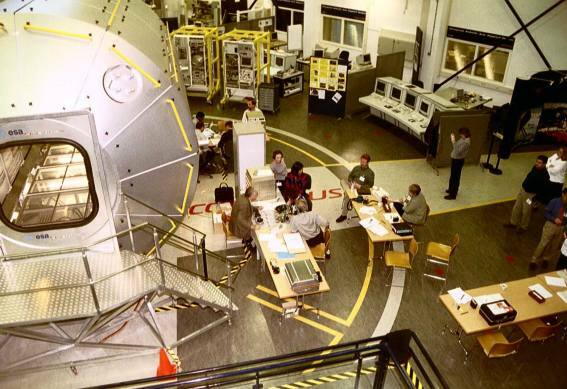 Al experiments located in the Biopack incubator can thus be started as early as 8 minutes after Shuttles' liftoff. Finally, because the Biopack is a relatively small payload, only a limited amount of experiments can be accommodated. Integration time and logistic complexity is reduced compared to larger facilities. The time scenario for future microgravity studies in the International Space Station puts high constraints on experiment design, especially for studies on mammalian samples. Experiment lead times are substantially increased when one assumes a consecutive experiment performance sequence in facilities such as Biolab (ESA) or the Gravitational Biology Facility (NASA). For these facilities, the first experiment in line can only start after about 4-8 days in flight. Delicate experiments that cannot endure any extensive storage periods can hardly be performed in typical ISS scenarios. The Biopack facility could be used to accommodate this special group of lead-time sensitive experiments. Samples capable of surviving prolonged storage at low temperature, dehydrated conditions, or in arresting phases such as seeds or spores, are better suited for Space Station timelines. To the extent feasible, the Biopack is an automated research facility in which autonomous experiments can be performed with minimum crew intervention. However, it is necessary that crew members manually transfer containers from one location within the Biopack to another, either for handling and inspecting samples or for moving them from the incubator to e.g. the cooler. For its maiden flight on STS-107 the Biopack facility includes a small multipurpose glovebox. In this portable glovebox, size about 50×35×15 cm, the Type-I and II experiment containers may be opened and specific experiment handling like sampling, fixing or video observations are performed. The Biopack glovebox guarantees an on-board safety level. When operational, the glovebox generates an internal negative pressure and, with its compound particle and chemical filter system, the box will scrub any small particles of chemical volatiles from its internal volume. into the orbiter atmosphere. Opening an experiment container will remove one of the three required safety levels for an experiment. Opening and handling the internal contents of a container may only be performed inside the glovebox. Picture (top view) of the Biopack portable glovebox. The two black gloves are clearly visible through its window. The motor and filter system are in the upper left corner. STS-107 Mission Specialist Laurel Clark during a hands-on training for the Biopack glovebox. Mr. Hartmut Helmke discussing the PTCU units with STS-107 pilot Willie McCool and payload commander Mike Anderson. ECs will be removed from the BEI for immediate return to the PIs. Transfer of the ECs will be in conditions as specified by the PIs. Besides the static positions for the microgravity samples, the Biopack centrifuges are capable to generate gravity levels up to, at least, 2×g in steps of 0.1×g, with a response time for µg to 2×g in about 10 seconds. All centrifuges are software controlled offering numerous experiment acceleration profiles as depicted in Figures 3 to 6. Experiments located in the static microgravity position in the incubator in combination with 1×g samples on the centrifuges, provide the classic setup for spaceflight experiments as have been applied in facilities such as Biorack, Biobox or CIS (Figure 3 A and B). Experiments can be conducted in the hypogravity area between microgravity (µg) and 1×g (Figure 3C). In such a scenario, threshold values for the various responses can be explored. Accelerations beyond the Earth's 1×g can be applied to evaluate whether the changes found in the hypogravity area continue in the hypergravity domain (Figure 3D). To overcome a possible effect of microgravity (countermeasure), an exposure for shorter or longer times to 1×g can be evaluated (Figure 4A). In addition, profiles could be applied sequentially to verify whether the exposure to 1×g, as such, is responsible for a response, or whether the transition and change in acceleration levels is capable of producing similar effects (Figure 4A versus 4B). Figure 4: 'Gravity change' profiles. If a microgravity response has already been demonstrated, peak pulses of gravity or microgravity at preset intervals could be applied to define any gravity-sensitive windows(2) within the samples under investigation (Figure 5A and B). Figure 5: 'Gravity impact' profiles. To investigate whether biological systems are sensitive to various accelerations, the impact of the total sum of loads given by the gravity level multiplied with exposure time could be analyzed. Although the total loads are similar, it could be interesting to investigate how biological samples will respond to different acceleration profiles (Figure 6A and B) and compare these data to an average of 1×g as per Figure 6C. Studies involving 'perception times'(3,4) can be done even more sophisticated. Gravity perception could be different when systems are exposed to sudden changes (previous figures), as compared to gradual changes (Figure 6D). Figure 6: Total gravitational loads and gradual changes. It may be clear from these theoretical profile plots that any other gravity profile could be applied by the Biopack centrifuges. This enables scientists to explore gravity related biological phenomena in more detail. The Biopack facility is currently (May 1999) in its detailed study and breadboarding phase. Phase C/D is anticipated to start mid 1999. The facility is build by Bradford Engineering (Heerle, NL) as prime contractor and HTS (Zurich, CH) and Dutch Space (former Fokker Space) (Leiden, NL) as main subcontractors. Its first flight shall be in Spacehab on board the STS-107 Shuttle flight, schedules for January 2001. 1 - Ballard Rodney W. Connolly James P. U.S./U.S.S.R. joint research in space biology and medicine on Cosmos satellites. FASEB J., 4, 5-9, 1990. 2 - Mesland D.A.M. Gravity effects on cells. Proceedings of the Fourth European Symposium on life sciences research in Space. ESA SP-370, 221-225, 1990. ESA/ESTEC, Noordwijk, the Netherlands. 3 - Larsen P. The development of geotropic and spontaneous curvature in roots. Physiol. Plant, 10, 127-163, 1957. 4 - Perbal G., Driss-Ecole D., Salle G., Raffin J. Perception of gravity in the Lentil root. Naturwissenschaften, 73, 444-446, 1986. 5 - Biorack on D1. ESA SP-1091, Eds. N. Longdon, V. David, February 1988, ESA/ESTEC, Noordwijk, the Netherlands. 6 - Biorack on Spacelab IML-1. ESA SP-1162, Ed. C. Mattok, March 1995, ESA/ESTEC, Noordwijk, the Netherlands. 7 - Biological Experiments on Bion-8 and Bion-9. ESA SP-1190, R. Demets. 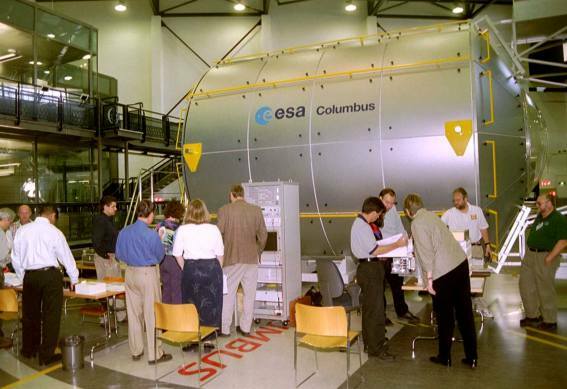 September 1996, ESA/ESTEC, Noordwijk, the Netherlands. This work is funded by the Netherlands Organization for Scientific Research (NWO) through the Space Research Organization of the Netherlands (SRON) and the Netherlands Agency for Aerospace Programs (NIVR) combined grant # MG-051 (DESC), the NIVR (Bradford Engineering) and ESA/Prodex (HTS). Dutch Space (former Fokker Space) (Leiden, NL) and MECON (Doetinchem, NL) are acknowledged for providing various drawings. This is an (updated) version of paper that was presented during the 7th European Life Sciences meeting 'Life Odyssey', in Maastricht, The Netherlands, 29 May- 2 June 1999. THE BIOPACK FACILITY. By van Loon J.J.W.A, Mastenbroek O., Lemcke C. Click here to download complete paper (PDF format). A previous, referenceble, description of the Biopack was published by Van Loon and Riesselmann in the ESA Microgravity News Vol. 11 No. 2. Overview of the activities during the STS-107 Crew Training in front of the ESA Columbus Module (COF) for International Space Station (ISS) at the Erasmus User Center (EUC) at ESA-ESTEC Noordwijk, the Netherlands. As indicated in paragraph 2.4 "Experiment lead time" the most of the experiments have to be prepared as short as possible before the actual launch of the STS-107 Shuttle. To ensure this the experiments are prepared in the labs of the faculty of biology of the Florida Institute of Technology in Melbourne near by the launch site at Kennedy Space Center (FL/USA). Also the Biopack 'ground model' is located in Melbourne. Ground control experiments will be executed in this model of the facility. The same protocols as used in flight will be imposed onto the ground samples so possible differences between 'in-flight 1×g' and 'on ground 1×g' may be identified. See also paragraph 2.2.1 'On-board centrifuges'. The onboard experiment and facility data is relayed to Florida Tech. From the same location tele-commands for experiment or facility operations and control are issued. 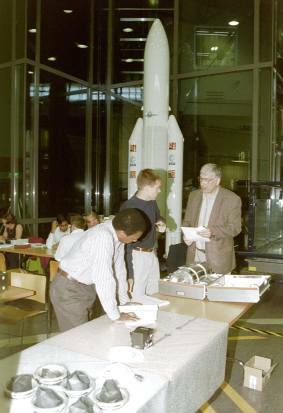 See a small video coverage of part of the Biopack Experiment Sequence Test (EST) as it was performed at the Erasmus User Center (EUC) at ESA-ESTEC in Noordwijk, the Netherlands, March 2002. Windows Media File Format streaming video: BIOPACK-EST.wmv (2.5 MB) or MPEG file format: BIOPACK-EST.mpg (18.5 MB). The first flight of the Biopack was during the STS-107 mission. But most unfortunately the descent of the Columbia Shuttle ended only minutes before landing at the Kennedy Space Center after a successful mission in an a tragic disaster killing all seven crew members on board: Colonel Rick Husband; Lt. Colonel Michael Anderson; Commander Laurel Clark; Captain David Brown; Commander William McCool; Dr. Kalpana Chawla; and Ilan Ramon, a Colonel in the Israeli Air Force. Our feelings go to their families and relatives as well as to all others involved in this mission. During this accident also all scientific samples and the Biopack itself were destroyed.